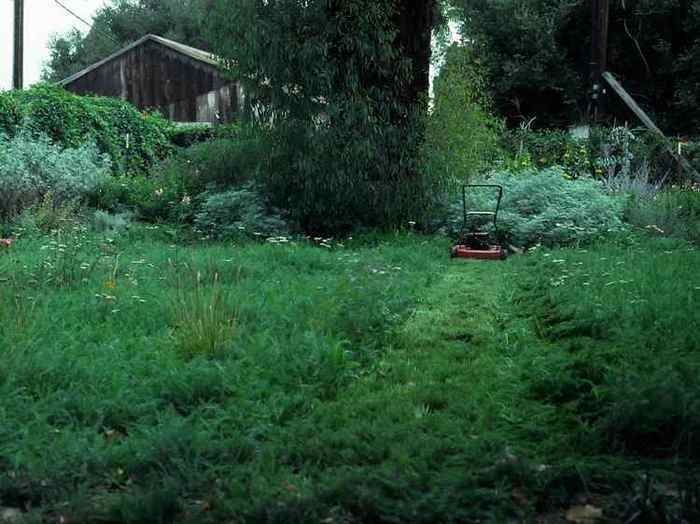 When visiting El Alisal, the garden at the Lummis House in Los Angeles, one is drawn to the open lawn area near the house. This green oasis in the otherwise desert-like setting is often used for social gathering and fund raising events. What is not obvious about this lawn, unless a closer examination is made, is that it is not planted in grass. Landscape Architect Bob Perry designed El Alisal as a drought demonstration garden. In keeping with this theme and the thought of maintenance mowing of turf grass, he decided to use yarrow (Achillea millefolium) instead of turf grass. The details on the planting and maintenance of this yarrow lawn are described in the fall 1991 issue of Pacific Horticulture. This treatment of an open usable space prompted us to try the same in the area west of our sales office. We use this area for company meeting, and employees often eat or rest here. Until late 1990 it was planted in tall fescue, which we watered on a weekly basis and mowed every two weeks. We planted our Yarrow lawn in February 1991. In the months prior to planting, the existing grass lawn was sprayed with repeated applications of Roundup and then physically removed. The soil was tilled and rolled to form a loose flat surface. Before the area was seeded, Autumn Moor Grass (Sesleria autumnalis) was planted in a well spaced uneven band along the back edged of the open space and 100 liner pots of Achillea Lavender Beauty', spaced evenly throughout the plot, were planted. The yarrow seed, mixed with a coarse sand, was applied next using a hand spreader. We used 1/8lb of both Achillea millefolium (white) and Achillea millefolium 'Rosey Red'. In using all of the seed in our 650 square foot area we slightly exceeded the recommended rate of application of 4 ounces per 1000 square feet. The surface was then top dressed with Kelloggs Topper applied with a wire roller and lightly irrigated. Then the newly planted area was kept damp until the yarrow began to germinate in the second week after planting. Once the surface was covered with the emerging seedlings, the intervals between watering and the duration on watering were steadily increased. Please Note: As the Coast Live Oak trees surrounding this area grew larger the yarrow lawn became more heavily shaded. In addition it had also experienced quite a bit of gopher damage. In 2005 San Marcos Growers decided to renovate the area and turn it into a water garden. Images of this water garden as well as more information on its construction can be found on our page on the Nursery Water Garden. Once the yarrow was established we watered it only when it began to show signs of water stress which was about every two to three weeks. This long interval between watering is partially due to our loamy soil and the shade from the afternoon sun that the trees overhead provide. The planting was fertilized twice a year during the growing season with Grow-Power (5-3-1) at a rate of about 25lbs per 1000 square ft. During the winter months the surface remained green but little growth occured and there was no need for irrigation, feeding or mowing. The first mowing was done 8 weeks after planting and every 6 weeks thereafter from April through November. If the surface was not going to be walked on and more flowering was desired, the mowing intervals could be greatly extended. Even though the mower blade was set high (4"), the surface had a mowed, but not unattractive look that lasted for 1-2 weeks.